Alexis is not your average high school graduate, her photographic memory and difficult personality usually making her a loner. But, when her life is further thrown into turmoil and tragedy strikes, everything she has known turns out to be based upon a lie. With her faithful friend Keats in tow, she sets out on a dangerous journey of self-discovery, with a mysterious stalker never far behind. Finding herself in a world populated by nothing less than myth and legend come to life, Alexis must survive to save the one person in the world for whom she cares the most. I’ve been looking forward to reading this novel ever since I’ve received it from C.L.Stegall; that cover, oh man, that cover!! It’s beyond fabulous, I just couldn’t stop thinking about it! Those haunting eyes are going to be the end of me. My honest fear after getting so excited about the cover was the book itself would prove somehow disappointing, it has happened to me before. Huge amounts of excitement over the covers translate into big time expectations from the novel; fair or not, I don’t know, but that’s how I function. The first few pages were very promising, so I found myself raising my expectations levels even more. By that time the fear had set in; the fear all this build-up will bring me to disappointment. As I kept reading, the build-up increased steadily, and along came childish excitement and the giddy feeling of being a kid again and reading the legends of Olympus. By the time I was done reading it, all that build-up, all that excitement, the entire feeling it gave me transformed into a crystal clear thought: The Weight of Night is a thing of beauty. Beautifully written, beautifully plotted, the novel never ceased to amaze me as the story developed. As characters struggled with their destinies, and I struggled with the tragic trail the story kept taking time and time again, unexpected thrills kept popping up, and I knew it: I was totally, completely hooked. I deeply loved the writing; put together with great attention, it effortlessly injects you into a world of powerful, distant, at times mischievous and generally whimsical gods, that plot, care and at times frolic; did it feel like a story featuring gods and demigods? You bet it did! The convoluted, peculiar thought process and general attitude that the Greek gods were famous for is a sturdy reality in C.L.Stegall‘s novel, while the demigods do show their mixed breeding, displaying more humane qualities that as a reader you’ll find quite easy to identify with and look up to. The story is filled with action, conflict/battle scenes, very tense situations, but you’ll in no way feel like the uncomfortable witness to violence described in gory details. The moral values highlighted throughout the story will make it easy for you to love the characters, and hard to actually hate them. While love trysts and love stories don’t abound, they aren’t in any way ignored or flicked through either, the balance between the presence of such topics and the intensity and level of disclosure make this novel a definite hit with younger adult audiences, I should think. As far as the main character goes, Alexis struggles with many thorny issues, from start to end. Things never get any easier for her, and just when you’ll think it cannot get any hairier then it is, it does. She has no other choice but to step up to the challenges that keep coming her way, and she develops beautifully from a somewhat confused and sort of distant girl into a strong self-confident woman-to-be. It is in many ways a beautiful story about maturing in the most difficult of circumstances. Why then have I not given it my full-force crush, 5 butterflies rating? It’s difficult to say why, but something didn’t click all the way into full-fledged fangirling. Perhaps it was my own guarded approach, the slight fear of disappointment somehow dampening my personal involvement. Whatever it was, it was on me, the novel itself was every bit capable of completely seducing me. And as I do like to point out now and then, my rating regards my personal subjective experience and not some objective view of the quality the book itself possesses. 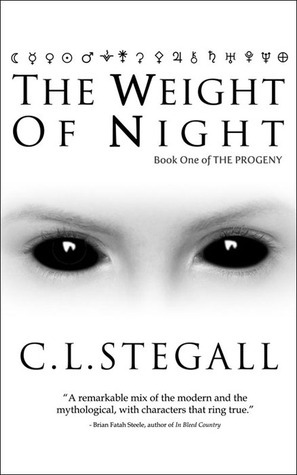 If you love stories about gods, demigods, beautiful and touching young adult stories, and great writing, then look no further, The Weight of Night is what you’re looking for.